Thanks kettlefish. I hope you have a peaceful and relaxing festive season, and the same goes to everyone else at Carcassonne Central. It is now Christmas Day here in New Zealand. Granted, only just. Best wishes to all, and a happy and prosperous New Year. This is great! Merry Christmas everyone! Thanks CKorfmann - It was my first go at Meeplroni Art - Hans Im Gluck have some on their Facebook page. Or as they say in the South Seas - Mele Kalikimaka! Here it is, a special tiles that I created for the day, still best wishes you happy holidays. 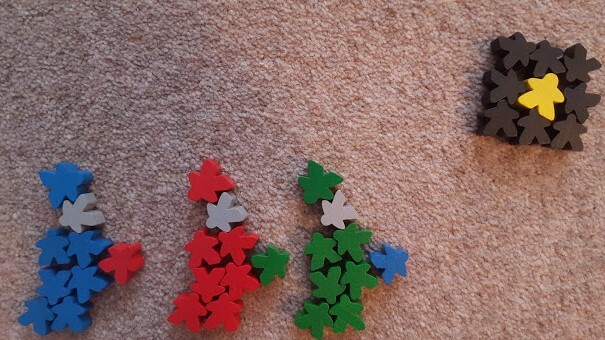 Can't compete with the amazing meeple- and tile-art of you, but wish a merry christmas to all of you, too. Merry Christmas all you peoples in later time zones. I got Pandemic Legacy, which is the main thing I wanted, so I guess it's been a successful holiday. Hope you all have an equally excellent day. Cheerio! Merry Christmas to you all. We hope that you all have a great day and that Santa brings you some lovely Carcassonne goodies! Happy Holidays. We celebrate today the 25th.